I don't know about the perfect boat but I put together one this year that has been a lot of fun. We've been able to do all kinds of stuff with it, even though it seems I'm always fixing something. Its a 30 yr old aluminum so what can I expect. It is now my flounder gigging/duck hunting boat, and works great for both. don't know but it was 27"
20x72 Gatortrax with 200 Honda or Yamaha. Maybe build a bow fishing platform for it as well. 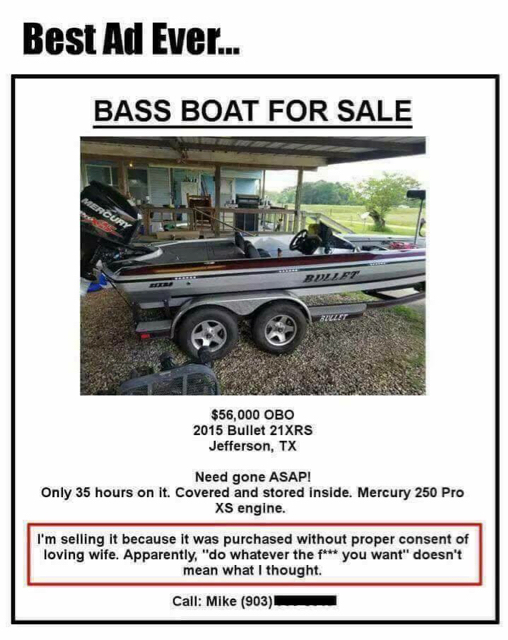 This guy thought he found the perfect boat. I studied on this same question last year. I wanted something I could fish for what ever was biting. Bought a Grizzly 2072 and so far I'm pretty happy with the decision. I mainly duck hunt but also fish a lot of shallow back waters and stumpy lakes. My tournament partner already has a zx225 that we use for most of our tournaments so having an aluminum rig makes sense so we could use it for stumpy lakes without worry of tearing up his glass hull and the dual jackplates and tunnel hull allow me to get most of the benefits of having a surface drive but still be able to fish tournaments. 27 ft Contender center console with dual 2 stroke 250's. Last edited by SaltwaterSlick; 01-12-2018 at 10:21 AM. I have an 18ft 90hp fisher that fit the bill for me and it's able to pull a tube and knee board with ease. It's for sale if your interested PM me. Since we went off on a tangent about the personal preference, I'd be tickled to be the owner of a Phoenix 921 Pro XP, Yamaha 250, 8' Blade PP's, dual Lowrance HDS 12's at console, Lowrance HDS 12 at bow. Photo of motor does not match motor of preference, but I wouldn't complain too much. I'm just much more familiar with Yamahas. I am not much of a fisherman either why I have this. I have actually hooked a trolling motor up to my old prostar 190 swim platform. Caught lots of fish out of the old MC. Realistically, I would probably get back into a Cape Horn. Step up the size to 31T and go with twin 300's. If I hit the lottery then it would be a Viking 68 or 72' EB for sure. Something like this would be my choice. Nice rig! have a 20' xpress flat bottom. waiting for the day when i can upgrade to a 22-24' express with the hyperlift hull. like being in an aluminum bass boat. Each persons perfect boat is different depending on how they use it. This is mine, crappie and bass fishing. I had a 24 foot bay boat before this one and it was a little much for the lake. Each persons perfect boat is different depending on how they use it. I have an 18 foot Champion that I have absolutely enjoyed. Love the ride and all the storage. It's like driving a sports car. But I find myself bass fishing less and chasing cats, whites, and crappie more so would love to have more floor space.......and a 4-stroke. Been a hard decision that I have yet to make. Guess I haven't found the "perfect" boat yet! A free one that i don't have to put gas in or fix. Saltwaterslick, I like your rig! I am not sure perfect boat describes mine, but it fits me well. 1654 Tracker with 40 hp mercury. Perfect for me would be something in the 18 to 20 foot range, wide with minimum 90 hp. Great minds think alike amigo. You are my spirit animal, ATW. I've never wanted or owned a boat or watercraft but spent plenty of time on the water over the last 40+ years with the same buddy/friend. Who owes who what? We forgot years ago plus we don't care. Perfect!! Best boat picture I've see so far! Fun City! No one "owes" anyone anything, but a simple offer to clean the boat up or pitch in for bait/gas, goes along way. I would never say anything to someone I invited out well because I invited them. I just won't be so quick to offer that up again. Bingo, same way on my boat. I sold mine a few years ago and my tournament partner has a skeeter we use for tournaments and fun fishing. I am either filling up the truck or the boat or towing with my truck, I'll bring him a gallon of yamalube every other month and I'll usually pay for breakfast or lunch. Just common courtesy in my eyes. No one ever understands how much this means to the boat owner until you have actually owned a boat. The truest sticker I've ever seen on a wakeboard boat was "cash, gas, ***, or grass, no one rides for free"
People say this all the time. I don't get it. I could say the same thing about hunting or just about any other hobby I'd be interested in. I just sold my boat this year because I just wasn't able to use it as often as I had been before due to life happening. That being said, I hated to see it go and thoroughly enjoyed owning it for 5 years. Of course, there is cost associated with maintenance and repairs if you break stuff. I was pretty scared when I bought my boat because of people saying this all the time. Initial cost was a lot because I needed lines, life vests, other safety equipment, recreational equipment upgrades that I wanted to do, etc, etc. But I can assure you, I spent WAAAAYY more money on fishing gear and tackle than I did on upkeep of my "crappy" Tracker. I guess to each his own. I'm pretty **** about maintenance and upkeep, so maybe that's why my boat didn't give me any trouble. I'll own another boat at some point. I had an almost identical sticker on my xpress. When a certain buddy showed up I said hey man I put something on this boat for you! He kinda chuckles and then realized I was serious. There are some really good boats out there but Texas is a big place with a lot of diverse water. For the last 11 years, I've been running two boats. A 16'x48" semi-v tracker with a 25 hp tiller and 12v trolling motor. It does most of the rough use and bass fishing. I've beat this boat to hell but it still works. I run a 2007 Triton LTS with a 225 hp Merc in bays and near shore. I've been toying with the idea of replacing the bay boat. 10 years of heavy saltwater only use is tough on a boat and I've been told I can break a bowling ball if left unsupervised. I've looked at the Haynie HO and bigfoot both look reasonable. For me, a 22'-24' center console with around a 225, a vee and a pocket tunnel is close. Getting up in 18" of water would be nice. Perfect boat would come down to location of live wells, how they are plumbed and pumps accessed, battery location, how the wiring trays are accessed, leaning post configuration, quality of gel coat on deck and if the local shop that's selling me the rig knows the set up and are decent to work with. I think all those old sayings come from when outboard motors were very finicky and broke down alot. Just like most thing, technology improves and these motors are better built and run longer. I've been running boats since I was 13. I've owned Glastron, Whalers, Grady White, El Pescador, Explorer, SeaCraft, and a few I can't remember. 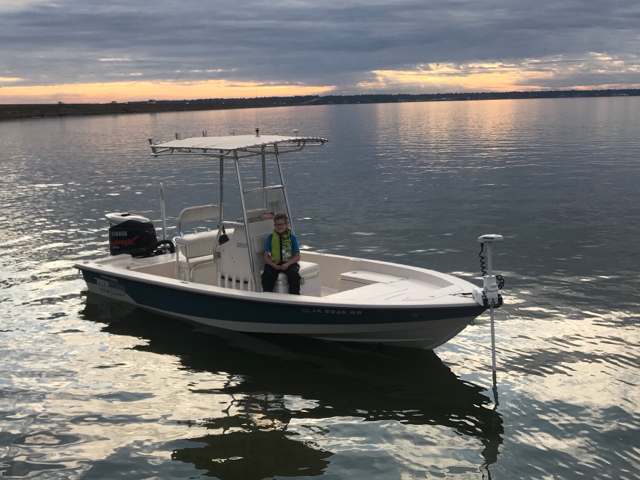 I bought a Tran Sport 24' SVT Cat last year and for bay fishing it's the best that I have had the pleasure to operate, so far. My suggestion is as matchejm said and to check out every boat that you are interested in and go from there. Boats are expensive to buy new, built to your specifications and are expensive to operate, maintain, and repair. But fishing and hunting are my passion so it don't hurt me that much to get what I want. 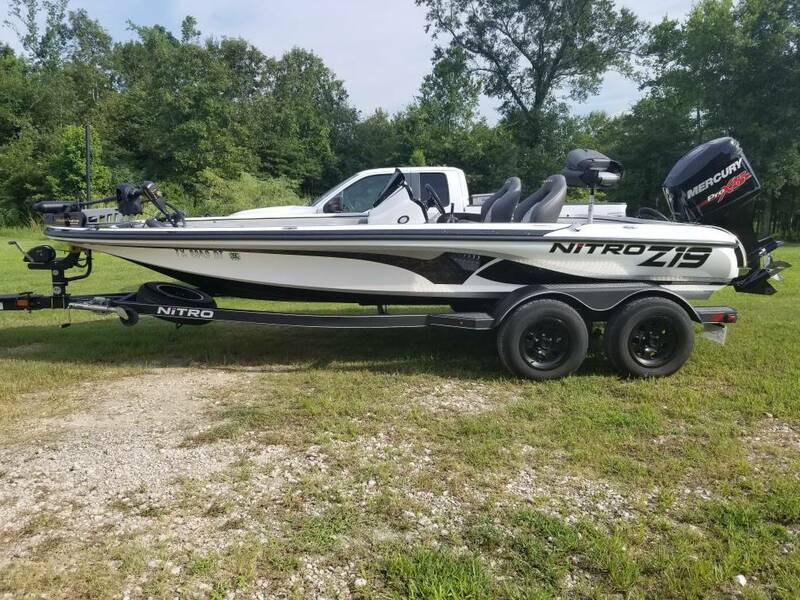 Tran Sport 24' SVT Cat, 250 Suzuki SS.